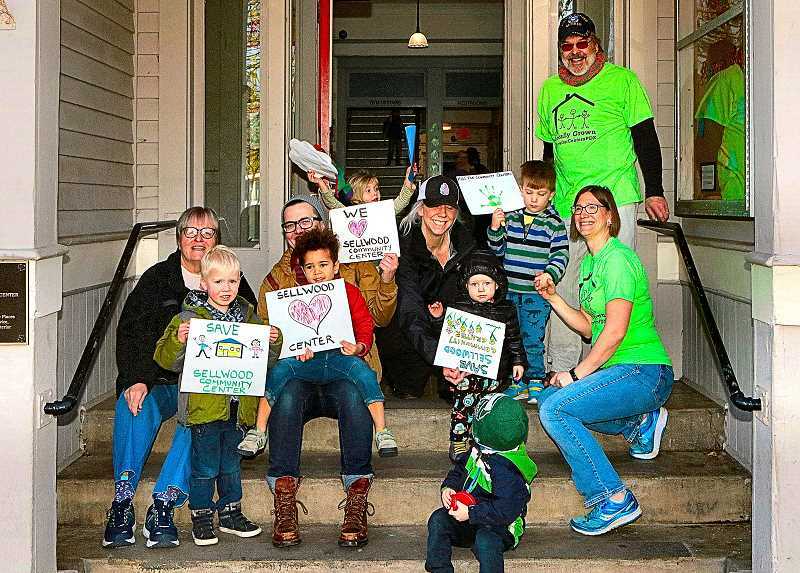 Based on the current Portland Parks & Recreation (PP&R) "Requested Budget Proposal" dated March 6, the storied Sellwood Community Center (SCC) will be shut down in September. This structure is over a century old, and is now listed on the National Register of Historic Places – even as it continues to be in daily use by area residents of all ages. In a written communication announcing the budget proposal, PP&R Director Adena Long reiterated, "Current projections show an estimated $6.3 million gap between expenses and revenue next fiscal year in the approximately $94 million operating budget." Long's message continued, "Our Budget Advisory Committee's values of safety, equity, maintenance, and financial sustainability guide our recommendations. In addition, we leaned heavily on what we have learned from the Budget Equity Tool, past budget processes, our cost recovery policy work, focus groups, and other data." On page four of the Requested Budget Proposal, under the heading "Recreation Services – Proposed Partnerships, Model Changes, and Closures", the Bureau proposes closing and leasing out the Fulton, Laurelhurst, and Hillside Community Centers. At the Community Music Center, located in the Creston-Kenilworth neighborhood, PP&R proposes "updating partnership agreement with CMC, Inc.", a nonprofit organization founded in 1960 to help maintain the Center as a City of Portland facility. Under the subhead "Transition and Close" is found Sellwood Community Center – slated to be shut down, forever, in September of 2019. After studying PP&R's budget documents, the Chair of SMILE's "Friends of Sellwood Community Center" Committee, Gail Hoffnagle, told THE BEE that she questions the information "leaned heavily upon" in making decisions – including the "focus groups and other data" mentioned by the Parks Bureau Director. "So far, no one has responded to our request for a meeting," Hoffnagle revealed. "So, without any public input, the city seems intent on closing this thriving center that has served the community for over 100 years." For years, the Park Bureau has threatened to close its "small" Community Centers, she reminded. "At last year's budget hearings, because of citizen outrage, the Mayor announced that the four 'small' centers would remain open for two years – while studies of financial sustainability, cost recovery, and level of service studies would be completed to determine the feasibility of keeping the centers open," remarked Hoffnagle. "Those city studies have not been completed – and only one of the promised two years has passed." Hindering the progress of these studies, Hoffnagle said, "we are told, were the chaos of the firing of the Park Bureau Director, the new Bureau Director search, changes in staff, and a new Parks 'City Commissioner', currently Nick Fish – so, only those 'behind closed doors' know who actually made the decision to close our Community Center." 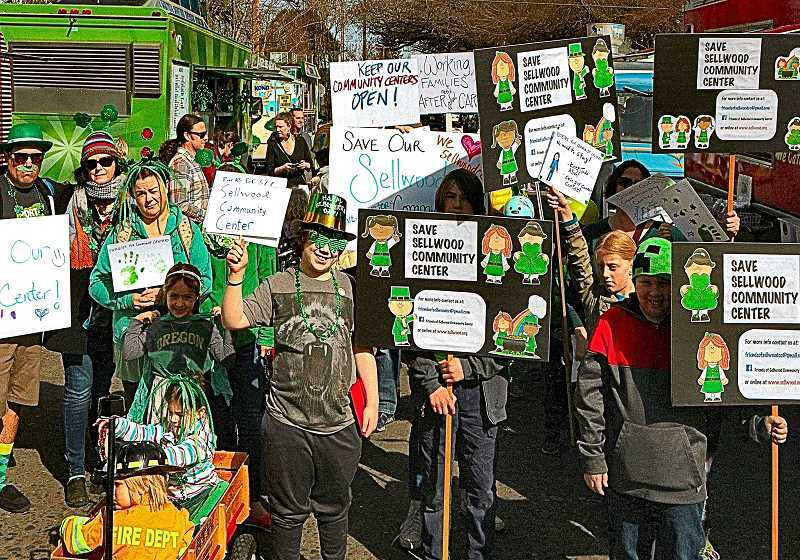 "For working families, the shortage of affordable recreation opportunities in the Sellwood-Westmoreland neighborhood is becoming a critical problem, made worse by the closing of the Sellwood Moreland Boys and Girls Club," she remarked. Woodstock, the smallest of the Community Centers on the "chopping bloc"
, and the only one without a gym, has been saved -- for now -- by its supporters, who've taken over running programs, and also provide of all the building's maintenance, making it self-sufficient, Hoffnagle said. "Biking to the Woodstock Center from Sellwood-Moreland would take 27 minutes, and it is a steep climb from Sellwood up to Chavez Boulevard (39th Avenue) along Woodstock Boulevard. Walking to Mt. Scott Community Center would take one hour and 24 minutes. So much for 'walkable neighborhoods' in Portland!" Hoffnagle exclaimed. With the population of Sellwood-Moreland burgeoning, mostly from the influx of renters in new apartment buildings -- and with more multi-family structures on their way -- a local Community Center is needed here more than ever, she pointed out. "For both the mental and physical wellbeing of our neighbors, there need to be places where people can get out of their house or apartment, meet others, and become active in the neighborhood," remarked Hoffnagle. "We need Sellwood Community Center to remain open." 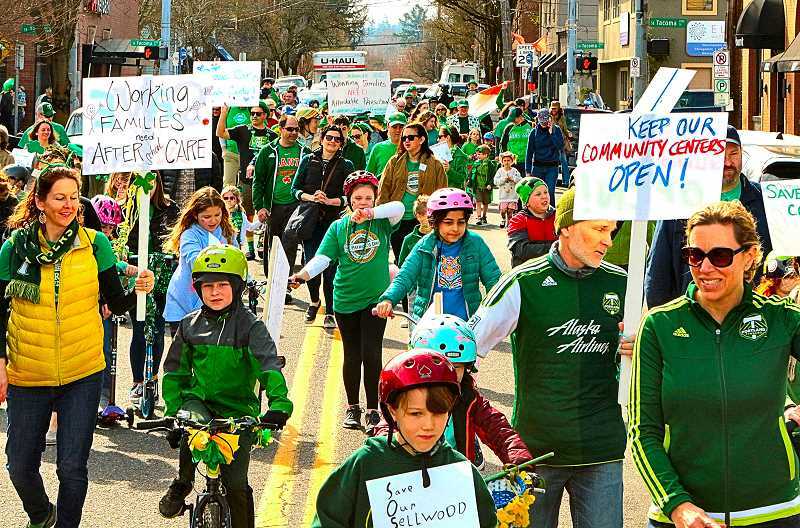 In the meantime, there appears to be one opportunity at least to watch this plan unfold: "Portland City Budget Community Work Session -- Parks, Recreation, and Open Spaces" is on April 9, from 6:30 until 8:30. If you care about how the City of Portland spends your tax dollars on these items, you might want to show up. However, DON'T expect to be able to say anything about it: The Parks Department announces, "Community members are welcome to watch/listen in person, or online at YouTube channel eGov PDX. There will be no public testimony at this event."